Savory chicken cooked with saffron, ginger, and cinnamon makes a delicious filling for Moroccan briouats. The filling is wrapped in a paper-thin Moroccan dough called warqa and the pastry is then fried until crispy. 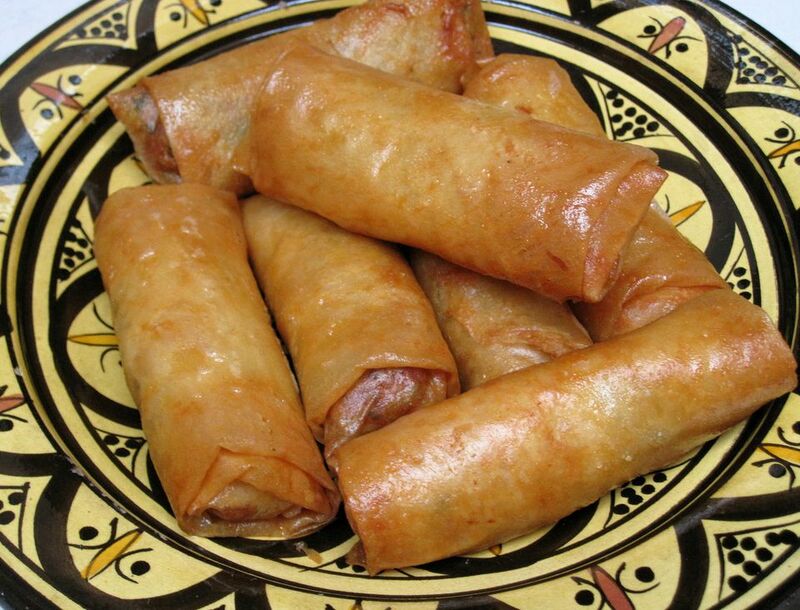 Phyllo (fillo) dough or spring roll wrappers can be substituted for the warqa. Briouats are usually served as a finger food or appetizer, but they can also be served as an entrée. They are quite popular in Ramadan, when they are served to break the fast. Briouats can be folded into cylinders or triangles. See How to Fold Briouats into Cylinders and How to Fold Briouats into Triangles. Mix the chicken with the spices and oils in a heavy-bottomed pot. Cover the chicken, and cook over medium to medium-high heat, stirring occasionally, for about one hour, or until the chicken is very tender and falls off the bones. Do not add water, and be careful not to burn the chicken. When the chicken is cooked, transfer it to a plate to cool slightly. Continue cooking the onions and sauce in the pot for another 10 to 15 minutes, or until the onions form a mass and the liquids are reduced to oils. Add the chopped cilantro and remove from the sauce from the heat. Fold the briouats. Briouats can be folded into cylinders or triangles. See How to Fold Briouats into Cylinders and How to Fold Briouats into Triangles. To fold cylinders as shown from warqa or phyllo dough, cut the dough into long strips about four inches wide. Brush the bottom half of the dough with melted butter. Place a large tablespoon or two of filling towards the bottom of the dough. Fold the two long sides of the dough into the center to partially cover the filling. Fold the bottom edge of the dough up over the filling to fully enclose it. Roll the folded dough up like a rug, sealing the edge of the dough to the roll with a little egg yolk. To fold large cylinders from square spring roll wrappers, place the wrapper so that it forms a diamond shape in front of you. Add two to three tablespoons of filling towards the bottom of the dough. Fold the bottom of the dough up around the filling, and the fold the right and left sides of the dough into the center so that the edges are straight and parallel. Roll up the dough like a rug, sealing the top edge of the dough to the roll with a little egg yolk. Cook or freeze the briouats. Deep fry the briouats in hot oil until light to medium golden brown, about five to seven minutes. Drain and serve. Briouats stay warm for a long time, but if frying them well in advance of serving, you can reheat them in a 350 degree oven for five to 10 minutes. Uncooked briouats can be refrigerated for one day or frozen for up to two months in a freezer bag or plastic storage container. They can be fried directly from the freezer, or allowed to thaw for 30 minutes to one hour before frying.